Bergdahl Faces Hearing To Determine If Court-Martial Is Warranted : The Two-Way The Army sergeant, who has been charged with desertion and misbehavior before the enemy, is appearing before the military equivalent of a grand jury. 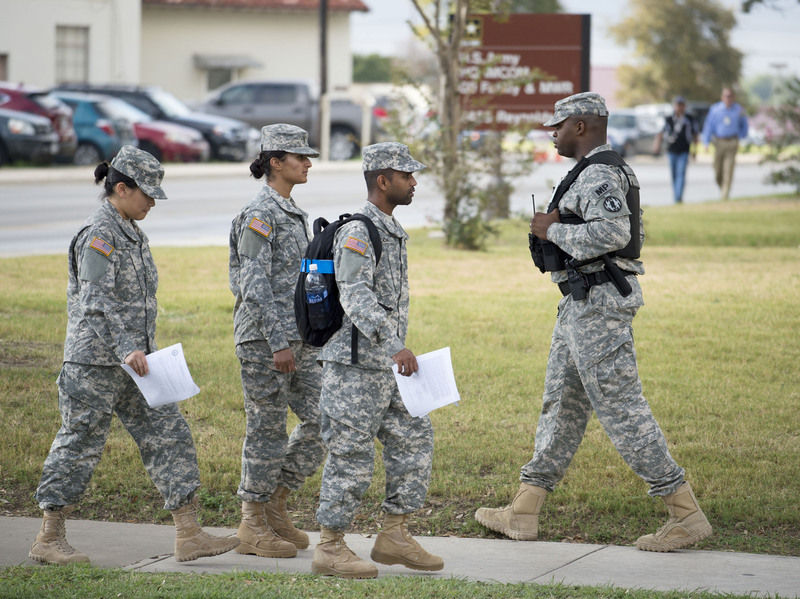 Soldiers walk past a military police officer (right) patrolling the perimeter of the U.S. Army IMCOM HQ building at Fort Sam Houston, Texas, prior to the Article 32 preliminary hearing to determine whether Army Sgt. Bowe Bergdahl will be court-martialed. Army Sgt. Robert "Bowe" Bergdahl appears Thursday before a military hearing at Fort Sam Houston, Texas, to determine whether he will face a full court-martial for allegedly deserting his post in Afghanistan. The soldier was captured by Taliban militiamen and held for five years before being released last year in a prisoner swap arranged by the White House. Bergdahl was charged in March with one count of desertion and one count of misbehavior before the enemy. The Article 32 hearing — roughly the equivalent of a grand jury hearing in the civilian justice system — had been set to take place in July, but it was subsequently postponed. "Some soldiers who served with the sergeant claim he walked off the base as a deserter, although other soldiers in his unit said Bergdahl sometimes talked of wanting to get off the base just so he could walk around the mountainous countryside. Nobody took that seriously because the very idea was practically suicidal; the enemy was thick in the area." Bergdahl is charged with one count of desertion and one count of misbehavior before the enemy. The decision regarding a court-martial is expected to take at least several weeks. The Associated Press reports that Bergdahl's lead attorney, Eugene Fidell, plans to call witnesses during the Article 32 hearing. Although the lawyer "declined to say if Bergdahl would be among them ... he has said details would emerge about the circumstances surrounding Bergdahl's disappearance from his post." A decision isn't expected for at least several weeks. As Army Times explains, once the Article 32 is completed, the report will be forwarded the general court-martial convening authority. 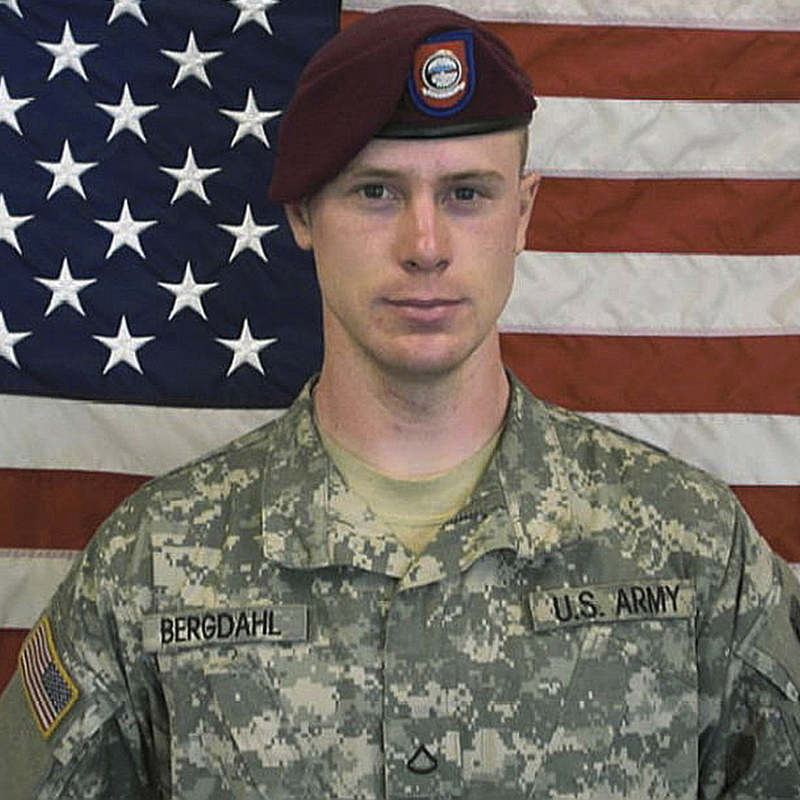 Several courses of action are possible — from no further action against Bergdahl to a special or general court-martial. "The desertion charge, which falls under Article 85 of the Uniformed Code of Military Justice, carries a maximum punishment of five years confinement, a dishonorable discharge, reduction to the rank of E-1, forfeiture of all pay and allowances. "The misbehavior before the enemy charge, which falls under Article 99 of the [Uniform Code of Military Justice], carries a maximum punishment of confinement for life as well as a dishonorable discharge, reduction in rank to E-1, and forfeiture of pay and allowances."